Kaisilver made to order rings can be crafted in gold or 925 silver, we place no restriction on design or gem selection. Our impressive tracked record of quality in terms of workmanship and service has, earned us over 7,000 clients across the globe. You can choose any jewels from our website and request for it to be made in gold or sterling silver, with your choice of gemstones. All made to order rings are made from start to finish, we do not rely on standard molds and fixed sample lines. You could request design modifications for our designs or even send us images and sketches of your own concepts. Skilled artisans work on each jewel, strong connections with gem mining and cutting operations on every continent, allow us to offer the highest degree of customization. 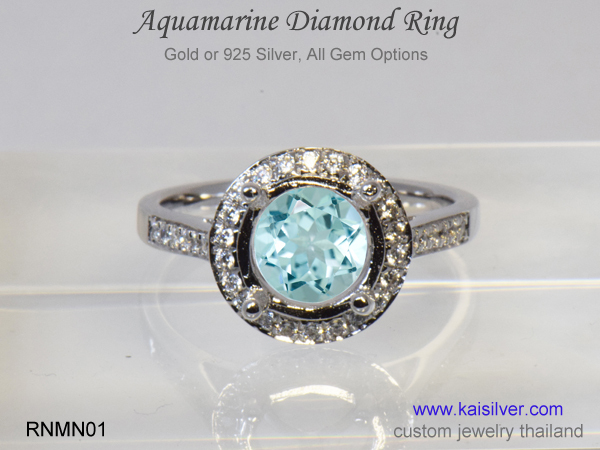 This section showcases some awesome gold and silver rings made to order, check out the detailed pages for each ring and you will realize why most quality conscious jewelry buyers prefer to get their custom made jewelry from Kaisilver. We can craft all types of jewels and styles and not just rings, so make sure that you get in touch with our team at sales@kaisilver.com before making your next purchase. 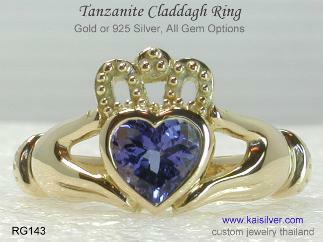 The legendary claddagh ring with tanzanite, the gemstone is considered to be around 1,000 times rarer than diamond. Kaisilver cladagh rings are made to order in gold or 925 silver, you choose the gemstone for your ring ... more. A very stylish and elegant tourmaline ring crafted in gold or sterling silver. 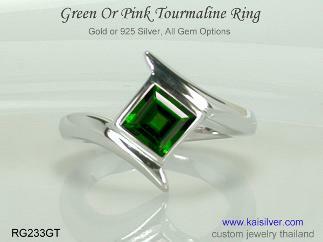 This tourmaline ring can be ordered with a pink or green tourmaline gemstone. You can pick any gemstone of your choice for the gold or silver ring ... more. An aquamarine diamond ring that defines the quality and status of true style. A fine look backed by a sturdy construction, no metal scooping inside the band and superior workmanship. Aquamarine custom rings with no design restriction ... more. A ruby ring that is built to last a lifetime and beyond. 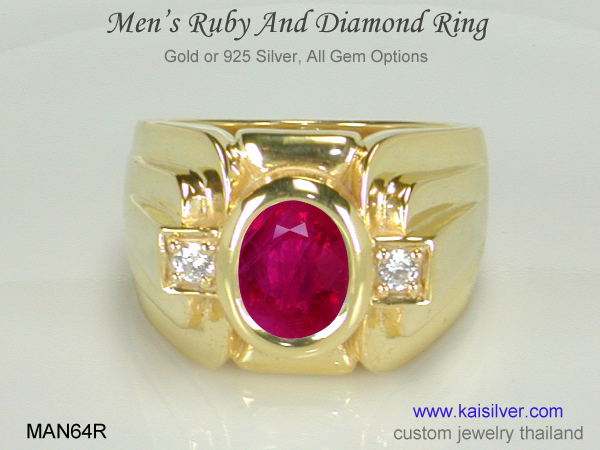 The MAN64r ruby gemstone ring has a natural certified ruby gemstone in the center. We have provided a hefty metal weight for the ring, this ensures long term durability ... more. 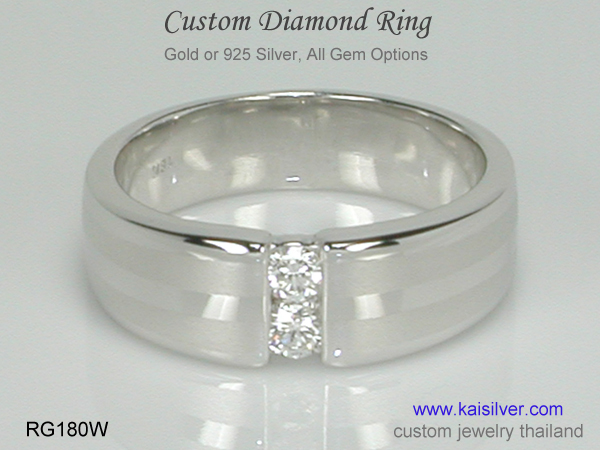 Men's made to order rings at Kaisilver give equal emphasis to stylish appearance and long term durability. 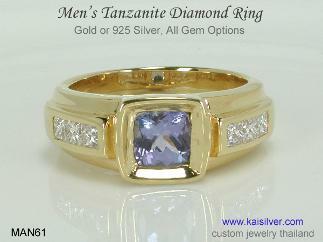 The MAN61 tanzanite and diamond ring for men has a design that ensures a comfortable and stress free wear ... more. 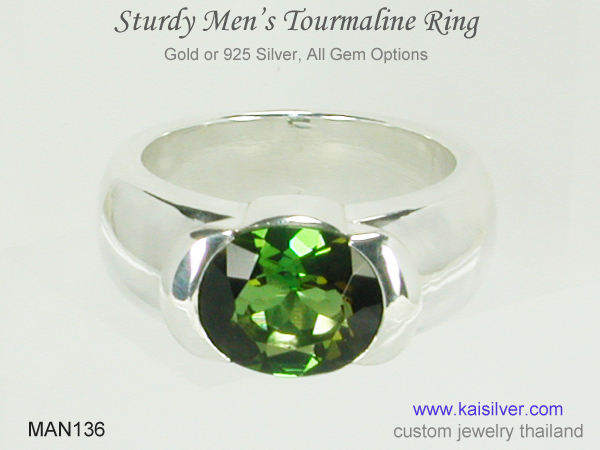 Men will love the sturdy build and large 11x9mm oval green tourmaline gem in this ring. We have provided a metal weight of 20 to 25 grams for the ring, larger ring sizes might weigh more. Suitable for prolonged use both formal and informal ... more. Custom moonstone ring, the four century old cladagh ring shown here with a moonstone gem. 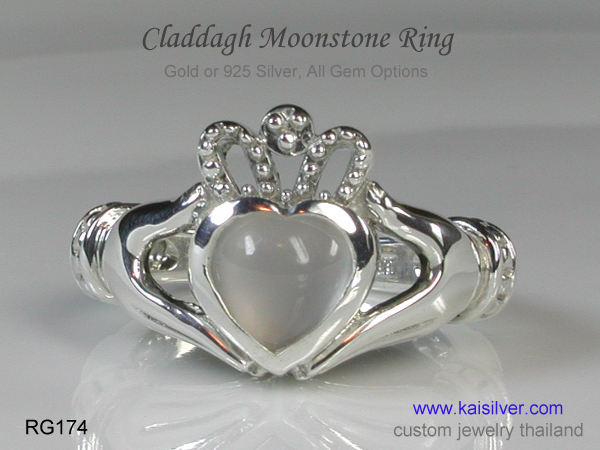 You can order your made to order claddagh gold or 925 silver ring with the gemstone of your choice. Learn more about the ring and the gemstone ... more. A sturdy diamond ring, majestic and elegant. This custom diamond ring is suitable for men and women. Each ring is fully custom made and we can accommodate all design modifications. Learn all about this custom made ring ... more.